Lifting Gear Hire (LGH) is preparing to expand its fleet of Hydra-Slide equipment after a period of sustained utilization of its three 500 ton capacity HT500 heavy track skid systems and power units. Bridgeview, Illinois-based lifting equipment rental specialist Lifting Gear Hire (LGH) is preparing to expand its fleet of Hydra-Slide equipment after a period of sustained utilization of its three 500 ton capacity HT500 heavy track skid systems and power units. The HT500 is one of the most cost-effective and accurate methods for moving, loading or unloading all types of heavy loads, including transformers, generators, compressors, pressure vessels, and other machines where a rigid, load carrying track is required. LGH also boasts three Hydra-Pac synchronous 10,000-psi hydraulic power units that provide synchronized control of multiple hydraulic cylinders. The fleet was customized by Don Mahnke, president; and Janine Smith, vice president, at the Ontario, Canada-based manufacturer, who sought to equip LGH with a means to provide a rental solution to North America’s industries where aging infrastructure and equipment, like transformers, need to be removed and replaced with minimum disruption and maximum efficiency. Patrick Clark, national rental support manager at LGH, attributes the subsequent success of the partnership to Hydra-Slide’s ability to tailor a solutions portfolio specifically to the needs of a target customer base. As a result, he said, LGH is now looking to expand the offering as the industry’s thought leaders and decision makers broaden their minds to alternative solutions following successful application of the HT500. 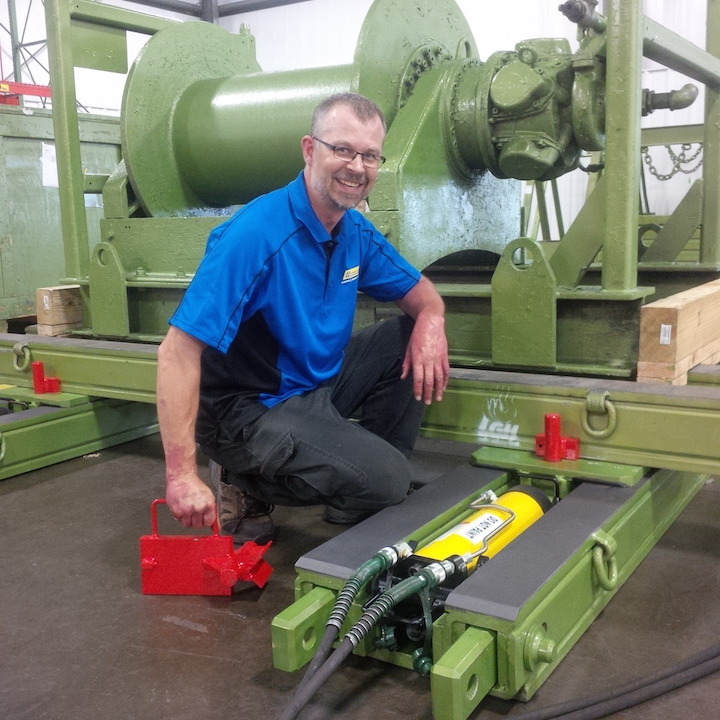 Clark believes there is potential for heavy industrial and lighter commercial projects to utilize Hydra-Slide’s “Up ’N Go” jacking skid shoes and engineered turntables. The skid shoes are a complementary product to the HT500, designed to fit the same track. The 250-ton capacity jacking cylinders can be connected hydraulically with any number of other shoes, increasing the system capacity to multiples of 1,000 tons, while maintaining equal load support and weight distribution. The turntables, meanwhile, rotate any heavy or over-sized load accurately and efficiently, even in areas of restricted access or clearance. Over the last three years, LGH has applied Hydra-Slide equipment to a myriad of applications and presently has an order confirmed for two HT500s on the same two-month rental. Clark said, not only do Hydra-Slide systems present an alternative to cranes and overhead solutions, or where limited space and headroom are available, they are also increasingly selected over other jack and slide systems. Two other case studies demonstrated the HT500’s capabilities. First, equipment-moving specialist Advantage Industrial Systems LLC was hired to complete the sliding of an electric fan motor; and, second, construction firm Robins & Morton performed the slide of two condenser units underneath a steam turbine tabletop. LGH has 22 locations across North America. LGH has positioned itself geographically for the customer’s ease of access to equipment and local (to the job site), timely assistance if needed. For LGH, it’s all about providing partnership in supply, service and safety. Robert Young, director of operations at Hydra-Slide, leads training sessions for Lifting Gear Hire. Janine Smith, vice president, Hydra-Slide Ltd.
California’s Sales Tax Exemption: Do you Qualify?